Chicago: 3rd morning delivery for carload lots. Minneapolis: 2nd morning delivery for carload lots. Seasonal employment in construction industry. Agricultural background of most workers creates increased mechanical ability, excellent trainability, positive motivation toward work, superior productivity, high degree of self-reliance, low turnover and absenteeism. Workers generally have a high average of education level and excellent record in the U.S. Armed Forces qualification tests. Walhalla, the center of the Pembina Hills, is located in northwestern Pembina County in the extreme northeastern part of North Dakota. It is approximately 66 miles south and 34 miles west of Winnipeg, Manitoba, Canada and approximately 66 miles north and 34 miles west of Grand Forks, ND. 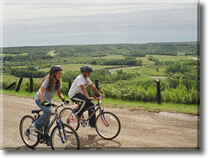 The city is 5 miles south of the Canadian border and 30 miles west of Minnesota; is served by ND State Highway No. 32, County Highway No. 55 and by Burlington Northern Railroad. Walhalla serves as a trade center of western Pembina and northeastern Cavalier Counties. It is a residential center and serves as an outlet for the agricultural and manufacturing products produced in the area.